Today was my last full day in Chennai: tomorrow I fly to Madurai. Today started early again, as I took a cab over to Gurukul at 8:15, in order to be there by 9:00 am. 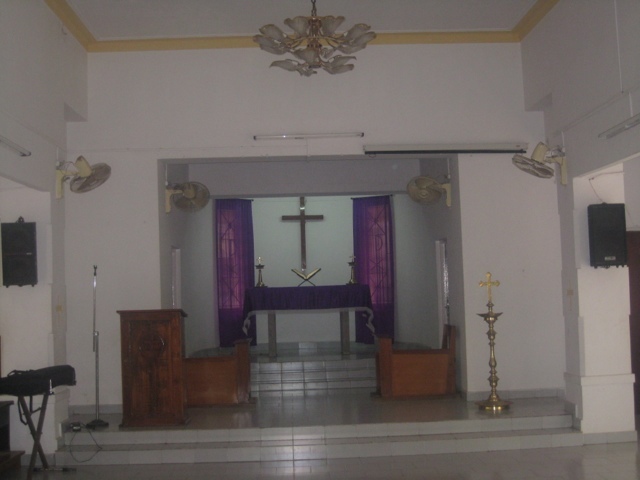 The United Evangelical Lutheran Churches in India has its offices there, and I was doing the short homily for their Monday morning devotions. 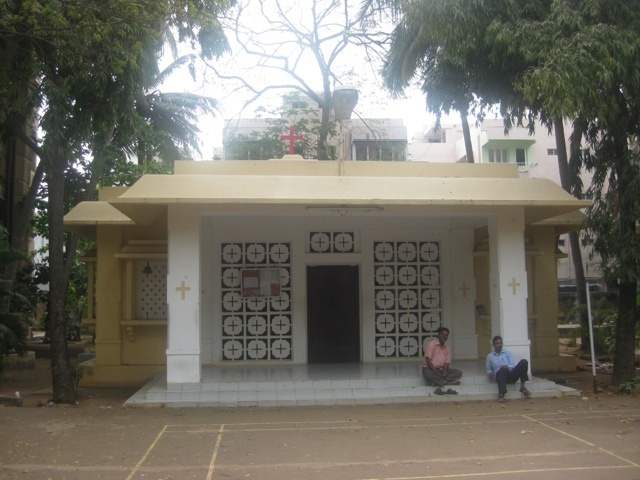 As a bit of background, there are 11 different Lutheran Churches in India, started by various mission groups, most of which are regionally-based. Beginning in the mid-20th century, the churches started to federate, in order to be able to work more cooperatively. Finally, the UELCI was formed in 1974, in order to mediate between the LWF and member churches, and also better facilitate the work of the different church bodies. There are departments for HIV/AIDS, Christian Eduction, Women, etc. At least 90% [if not more] of all Christians in India–not just Lutheran Christians–are Dalits, primarily because they were the ones most receptive to the message of the early missionaries. The one exception to this is in Kerela [the state of India located on the southwest coast], particularly with the Syrian Orthodox, where they claim an ancient tradition of upper caste coverts. Caste is still very relevant, of course–although in the cities, economics trump caste: so, for example, if a Dalit hires a car from a caste Hindu, the Hindu is, at least for a few hours, the employee of the Dalit, and will treat her with proper respect. 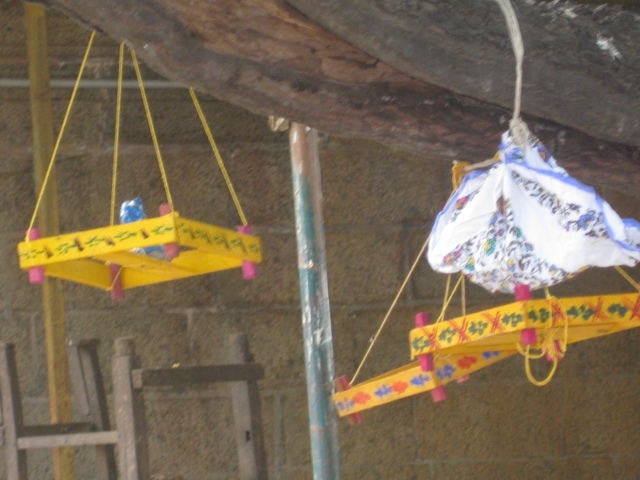 In the rural areas, however, caste violence is still a very real problem. However, it is even more complicated than that: there is also tension, and sometimes even violence, among members of different groups within the same caste–so, for example, even within the different Lutheran Church bodies, there are tensions between different Dalit groups. Human societies never fail to construct hierarchies, it seems! 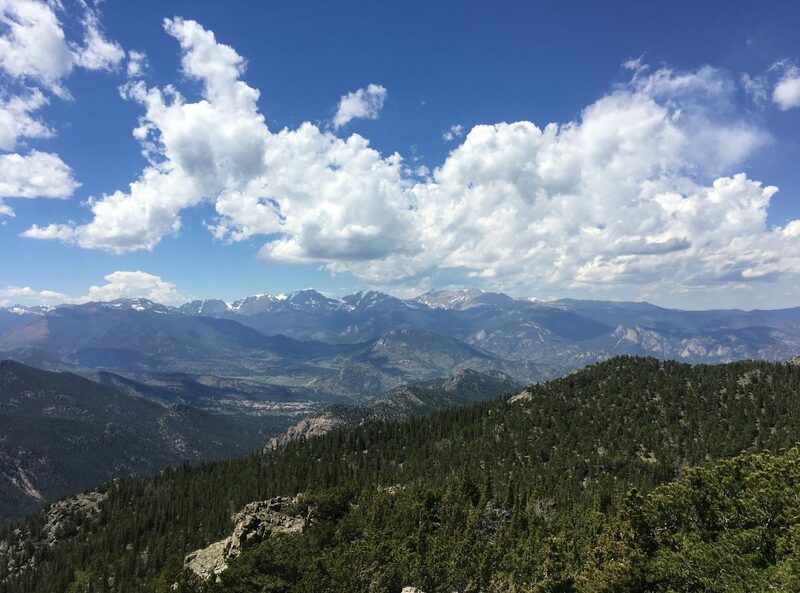 I also wanted to say that even though many–though not all–of the Indian Lutheran Church bodies ordain women, there is still lots of cultural resistance to women in ministry, and they continue to have a much harder time finding calls here. This year, in the BD program [Bachelor of Divinity], there were only 2 women out of 30 graduates. “I believe in God who created woman and man in God’s own image, who created the world and gave both sexes the care of the earth. I believe in Jesus who discussed theology with a woman at a well and first confided in her his messiahship, who motivated her to go and tell her great news to the city. I believe in Jesus who received anointing from a woman at Simon’s house, who rebuked the men who scorned her. I believe in Jesus who appeared first to Mary Magdalene, who sent her with the bursting message GO AND TELL…. I believe in the wholeness of the Savior in whom there is neither Jew nor Greek, slave nor free, male nor female, for we are all one in salvation. [Excerpted from Jesus and the Freed Woman, by Rachel Conrad Walhberg]. Anyway, it was nice meeting everyone and listening to the reports from the different departments. 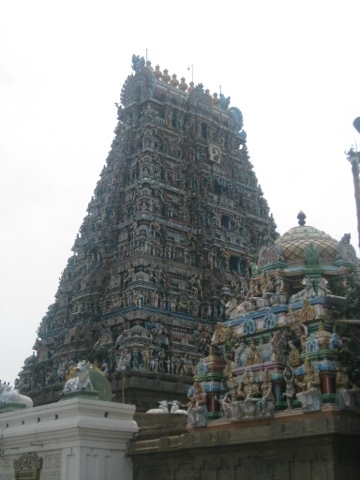 Then, it was off to Kapaleeshwarar Temple, which I have been dying to see since I arrived! 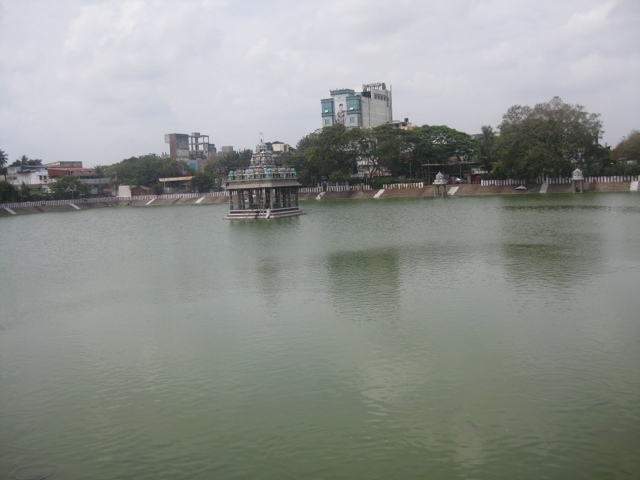 It is the most active and most impressive temple in Chennai: there were tons of people there when I visited–and in addition to the one wedding that was going on while I was walking around, there were two other sets of bride & groom. [I had read that there are often many Hindu wedding right around the time of Holi, because it typically is considered an astrologically auspicious time]. 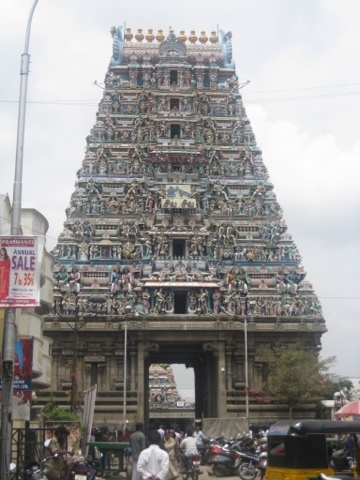 The Kapaleeshwarar temple is constructed in the Dravidian style [traditional South India], which means that it has a large gopuram–a gateway tower, and an enormous water tank nearby. The tower itself, as well as many, many smaller towers throughout the temple [which has a large variety of different shrines], are covered with colorful three-dimensional figures. 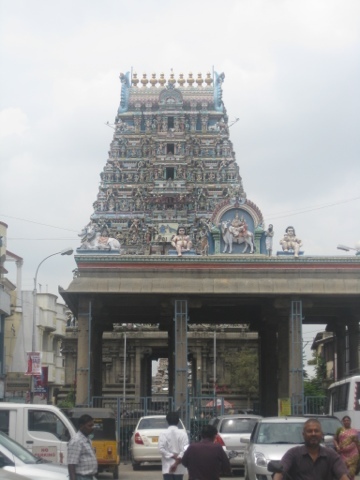 The temple is dedicated to Shiva, and the name of the area in which the temple is located–Mylapore–comes from the legend that the goddess Uma worshipped Shiva in the form of a peacock [“mayil” in the Tamil language]. There is a special shrine that celebrates this. However, the heart of the temple complex is what they call the “sanctum sanctorum” [Interesting, right? 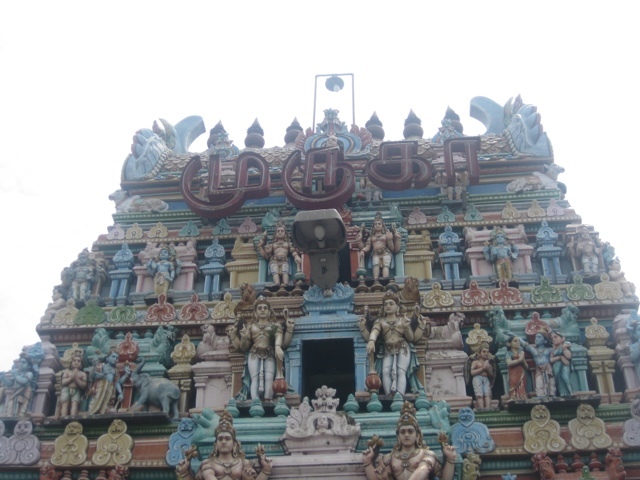 That is how it is described on the entrance plaque]: this is where the main deities reside, and only Hindus are allowed inside. 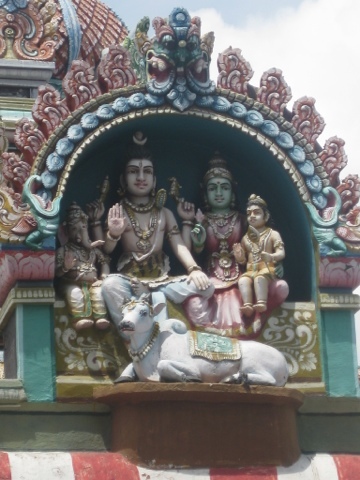 It is interesting that the actual idol itself is not an anthropomorphic image of the Shiva, but rather the lingam. This is what the plaque says about that: The lingam “is the symbol of the form and formless aspects of the divine, the highest concept of the transcendental and immanent God.” Right when you enter the complex, there is one particular altar where devotees are supposed to go first and make an offering, and then receive a blessing from one of the priests. This is an act of devotion that is meant to purify one before actually going into the sanctorum. It was really interesting walking around, and watching all of the different acts of devotion: some people were prostrating themselves, others standing in prayer, others circumnambulating the different shrines, and others leaving little pieces of paper with mantras or prayers tied around a special tree, and even leaving little paper cradles hanging from the same tree–the women do this are hoping for children. In addition, every day there are six official daily pujas, but the temple is also closed every day from 12:00-4:00, so that the deities can have their nap! Now, time to pack before checking out tomorrow!